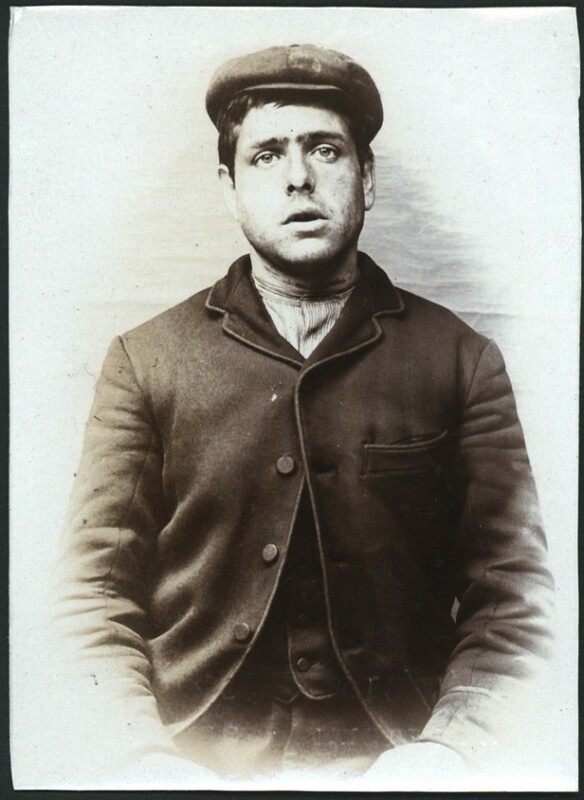 Name: Matthew Armstrong Arrested for: not given Arrested at: North Shields Police Station Arrested on: 19 July 1906 Tyne and Wear Archives ref: DX1388-1-91-Matthew Armstrong The Shields Daily News for 26 July 1906 reports: ?LARCENY CASE AT NORTH SHIELDS. At the North Shields Police Court this morning, Matthew Armstrong (24), miner, 31 Roseberry Avenue, Preston, was committed to prison for one month, on a charge of stealing 5s from the till at the Fox Hunters Inn, the property of Adelaide Storey, on the 18th inst.? These images are a selection from an album of photographs of prisoners brought before the North Shields Police Court between 1902 and 1916 in the collection of Tyne & Wear Archives (TWA ref DX1388/1). (Copyright) We're happy for you to share this digital image within the spirit of The Commons. Please cite 'Tyne & Wear Archives & Museums' when reusing. Certain restrictions on high quality reproductions and commercial use of the original physical version apply though; if you're unsure please email archives@twmuseums.org.uk.